Women's Hair Loss Blogs List. The Best Women's Hair Loss blogs from thousands of top Women's Hair Loss blogs in our index using search and social metrics. Data will be refreshed once a week. London About Blog Find news and advice on hair loss in women. Facebook fans 8,523. Twitter followers 6,227. Columbia MD About Blog Wigs and Hair Solutions is committed to treating clients with medically related hair loss through hair replacement and custom fitted wigs. Facebook fans 550. Twitter followers 19. Asheville, NC About Blog The Big Life blog is about sharing research, the best hair care products, tools, new treatments, replacement therapies, alternatives, breakthroughs and life stories for and with women with thinning hair or female hair loss. Facebook fans 175. Twitter followers 19. Los Angeles, CA About Blog Discover different ways to treat thinning hair and hair loss in women. Find out about hair cover up products, natural remedies for hair loss, and the latest hair tips and trends. Facebook fans 25. Twitter followers 1,208. About Blog The Women's Hair Loss Blog keeps you up-to-date with all the new articles added to the hairsentinel.com Web site, plus news of the latest hair loss discoveries and treatments. Discover the many hair loss causes affecting women and find out how to restore YOUR hair to its former glory. Facebook fans 11,891. Twitter followers 67. About Blog Female Hair Loss is a website dedicated to helping women who suffer from hair loss with industry-leading tips, tools, and recommendations for recovery. About Blog An open conversation about women's hair loss, rocking wigs and hair toppers, & more. Jacksonville, FL About Blog Find information on treatment of hair loss in men and women! Facebook fans 819. Twitter followers 32. United Kingdom About Blog Helping women overcome hair loss quickly! Facebook fans 7. Twitter followers 134. Matthews, NC About Blog Stay tuned for the latest news on haircare tips & best solutions for baldness, hair loss & hair thinning problems. About Blog This hair loss blog at GirlsHairTalk.com will keep you Updated with all of the latest women's hair loss articles here on GirlsHairTalk.com website. Los Angeles, CA About Blog A Community For Women Dealing With Hair Loss - Help, Hope and Understanding Founded in 2007. Facebook fans 5,185. Twitter followers 230. 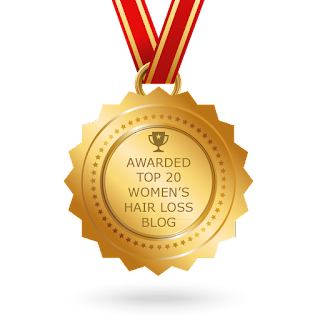 CONGRATULATIONS to every blogger that has made this Top Women's Hair Loss Blogs list! This is the most comprehensive list of best Women's Hair Loss blogs on the internet and I’m honoured to have you as part of this! I personally give you a high-five and want to thank you for your contribution to this world.